Creatures 3 is an Artificial Life simulation game, the third one in the Creatures series. The game takes place on an abandoned spaceship called the Ark, which was sent into space after Albia had been destroyed and the Shee left towards Sphericus. The Ark has several different terrariums in which Albian environments have been recreated, and show up as metarooms in the game. The game can be docked with Docking Station, a standalone game with 4 metarooms and support for transferring creatures and messages to other players. Docking Station can be downloaded for free. Creatures 3, Docking Station and Creatures Village all run on the Creatures Evolution Engine. This game is no longer available in the shops in its original form, but it can be purchased as part of the Windows-only Creatures Exodus for Windows, the Windows+Mac dual format Creatures Exodus for Mac OS X, or the Linux-only Creatures Internet Edition for Linux. The GOG Creatures Collection is another remastered edition of Creatures Exodus, compatible with Windows 10. The game / addon is run only by a user with complete administrator privileges.So make sure that this is the case. You must install (or reinstall if already installed) under a Windows XP user that has complete administrator privileges. Also, the game can only run (be played) by a user with the same privileges - ie, complete administrator privileges. 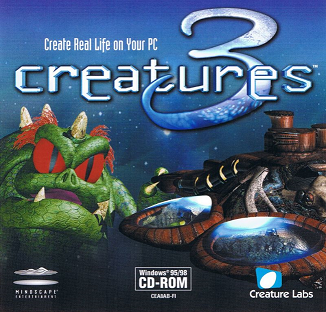 Creatures 3 was widely anticipated prior to its release in November 1999; although many who were still bitter about the rushed release of Creatures 2 decided not to buy it, some later relented. There were indeed a few problems at launch, but not on the same scale as the last game; most notably, some of the norns did not use the full range of facial expressions available to them, and a new genome (expressive norns) had to be released to fix this problem. Although the creatures in Creatures 3 were intended to ship with an "improved social ability", this was not functional at a brain level until the Creatures Full of Edits were released in 2008. Additionally, the initial ecology of the different terrariums, while complex, would often crash, leading to a barren environment: several fan-made patches have attempted to fix this, most notably the Norn Woodland Fix Patch for the Norn Terrarium. Read the Creatures 3 Credits, or find out more about how the backdrop images were made (more here). Many other metarooms have been created as third-party addons - many of these require the use of the free Docking Station addon. There are numerous machines all doing different things in C3. The player must get their creatures to push the power-ups to make the larger machines work (creatures call the power-ups "tool"), and the larger machines often require bioenergy to function. The machines may be linked together to do different things. There is an extensive list of breeds for Creatures 3 (and Docking Station). The engine designed for Creatures 3 was actually released first in Creatures Adventures. During development of Creatures 3, Unix scripting tools were used under Windows to write an automatic build process. Creatures 3 has very subtle seasons on the Ark. Gameware's Creatures 3 Downloads Free downloads for Creatures 3 including Magma Norns, Yule Pack, Grettin Switch, BioPellets and Update. This page was last modified on 3 August 2018, at 20:59.